Norwegian Cruise Line, Bygg nr. 6298-6303 ved Fincantieri Shipyard, 140.000 GT Cruise vessel 6x "Norwegian TBN"
Norwegian Cruise Line Holdings has reached an agreement with Italian shipbuilder Fincantieri for the construction of four new cruise ships, with an option for two additional vessels, for its Norwegian Cruise Line brand. The company’s four next generation ships are scheduled for delivery in 2022, 2023, 2024 and 2025. If NCL exercises the contract option, the two additional cruise ships would be handed over to their owner in 2026 and 2027. 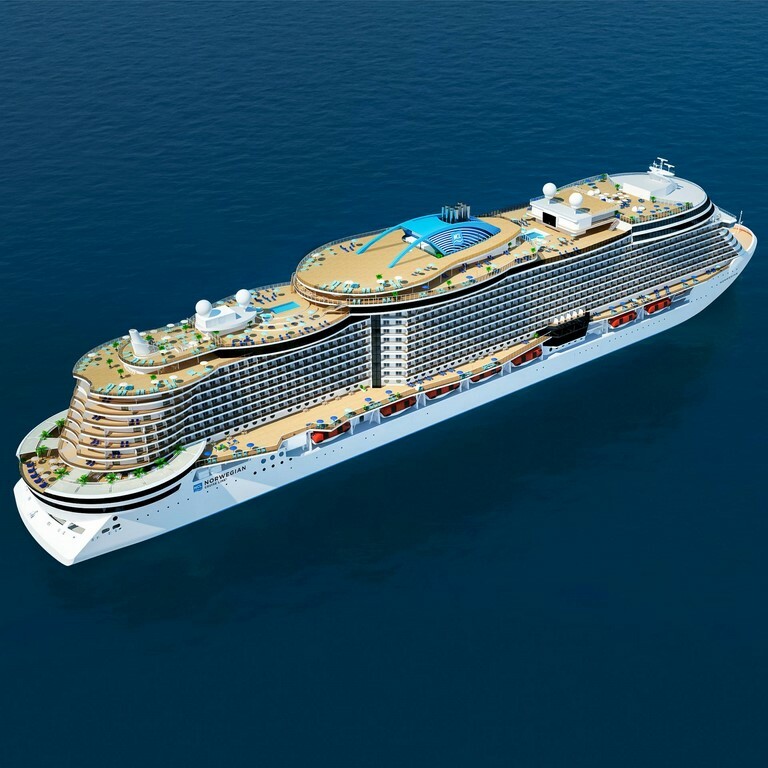 Ordered at a price of EUR 800 million (USD 850.1 million) a piece, each of the four 140,000 gross ton ships will accommodate around 3,300 guests. Norwegian Cruise Line said that it obtained export credit financing with favorable terms to fund 80 percent of the contract price of each ship delivered through 2025, subject to certain conditions. “This new class of ships will continue Norwegian Cruise Line brand’s legacy of introducing meaningful innovation to the cruise industry,” Frank Del Rio, president and chief executive officer of Norwegian Cruise Line Holdings, said. The new class of ships will build upon the brand’s most recent Breakaway-Plus Class ships. A priority of the prototype design is energy efficiency, with the aim of optimizing fuel consumption and reducing the impact on the environment, according to the cruise company. Noken som har hørt om opsjonen på femte og sjette skipet blir noko av? (1:10 p.m. EDT) -- Now that Norwegian Bliss -- Norwegian Cruise Line's newest ship, custom-built for Alaska -- has been delivered, what's next for the line? While onboard Norwegian Bliss, Norwegian Cruise Line President and CEO Andy Stuart, took time out to speak to Cruise Critic. Here are a few reveals about the line's next class of ship, the smaller Leonardo Class; environmental concerns; cruise slowdown in China -- and the dangers of new technology. As previously reported, the first of four Leonardo Class ships launch from 2022 through to 2025, with an option of two more. The 3,300-passenger ships sit between Norwegian's two current size ships -- the 2,000 and 4,000-passenger classes. Why this particular size? It's all about the ports, Stuart explained. "Leonardo Class will be a slightly smaller footprint, so that gives you more options in terms of ports. There are some ports which can't take a big ship like Bliss," he said. "And there are some ports that from a capacity standpoint we wouldn't want to go in with a brand-new ship that has 4,200 beds, we'd prefer to start with one with 3,300 beds. There are some where we'd prefer to start with 2,000, but 3,300 gives us something in the middle with a lot more flexibility to enter a destination a bit earlier than with a big ship like this." Flexibility and variety are also important, Stuart said. "We really like this idea of these three different sizes of ships that gives us a lot of flexibility. We are as a brand thinking about things a little differently. We want to offer variety,… and we thinking having another size in between offers another option, and a sense of flexibility and choice. "The jump from 2,000 beds to 4,000 beds is quite a big one. If you go 2,000 to 3,000 to 4,000 that's a more measured increase that will allow us to maybe accelerate a move into another market." In terms of what the ships will look like, media were shown a rendering, which shows a much wider Boardwalk area at the aft of the ship. A series of aft cabins that look like Miami condos -- similar to what MSC Cruises did on Seaside -- were also shown. "The connection to the sea is definitely going to be to the next level in this next class of ship," Stuart said. "What we've learned from this class of ship is people want that…We are bringing the connection to the ocean that's typically on the top deck more effectively down to lower decks." The ship will have an inverted bow, which will improve its flow through the water and make it look "more futuristic," Stuart said. Stuart did not give many details on Norwegian Encore, which will be the last in the Breakaway Plus class of ship and launches in 2019. When asked whether there would be a new show onboard, all he would say was: "Entertainment will continue to evolve, yes." None of the Leonardo-class ships will be pioneering new fuel technology; the company is not going down the path of LNG-powered cruise ships that Carnival Corp. has started on. "The next new build, we will evaluate all the technologies available to us," Stuart said. "We don't have a specific class beyond Leonardo at this point and we don't have any specific plans. We have the two options for Leonardo but it's not possible for us to change those ships." Norwegian will give more details about how it is tackling environmental issues in a report to be published on April 23rd -- Earth Day. Bliss has many new features and the old iConcierge phone app has been replaced by a next-generation program called Cruise Norwegian, which offers a multitude of functions that can be used from the time of booking through disembarkation day. But don't expect the line to go full robot. Stuart said the line takes a "thoughtful "approach to technology. "You don't want 4,000 people wandering around the ship staring at their phone," he said. "And I think you've got to be careful you don't have 1,800 crew with their heads in iPads. We think we can meaningfully change the guest experience using technology but we don't want to do it in a detrimental way." Embarkation is one area where Stuart sees technology playing a role. " We're going to do it one step at a time and how we can use technology to give you more choices in a more effective way." Norwegian was planning on deploying Encore in China, to join Norwegian Joy but those plans have been changed as China's growth slows and the North America cruising market stays strong, Stuart said. "We think about China as another market," Stuart said. "We're not going to obsess about it. We see it as a market with long term opportunity. Joy is making money, guests are happy and we'll review deployment. There are no short-term plans to put another ship into China." All in all, Stuart sees a bullish outlook for the cruise industry for the next few years. "I think we have a strong economy, consumer confidence is high," he said, noting that people are spending money for cruises nearly two years away. "The cruise industry is a good barometer for the economy." 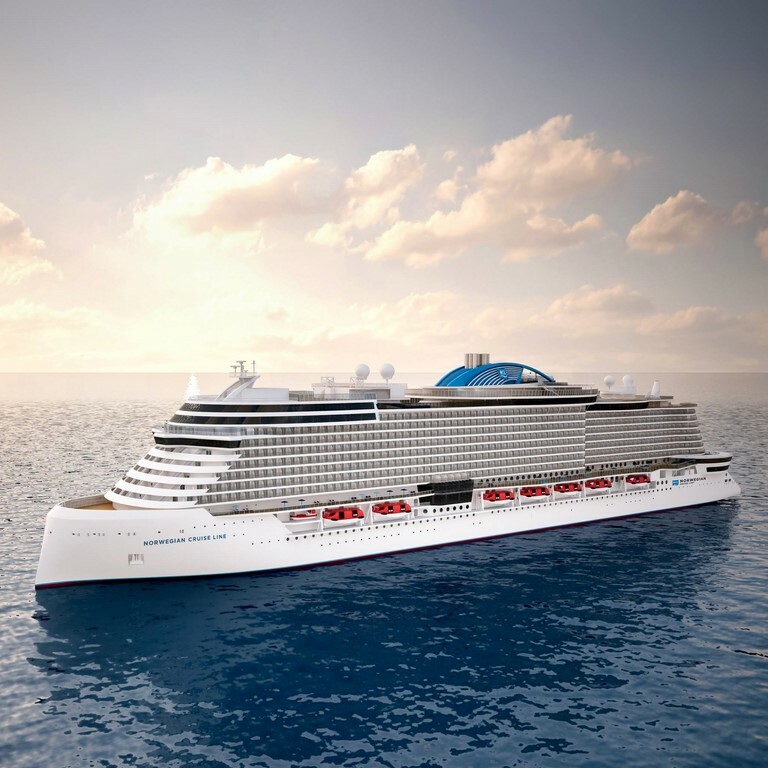 Norwegian Cruise Line Holdings announced today it confirmed its options for the fifth and sixth Project Leonardo Class ships with Fincantieri for Norwegian Cruise Line for delivery in 2026 and 2027. Norwegian Cruise Line will now get six Leonardo-class ships with deliveries starting in 2022. 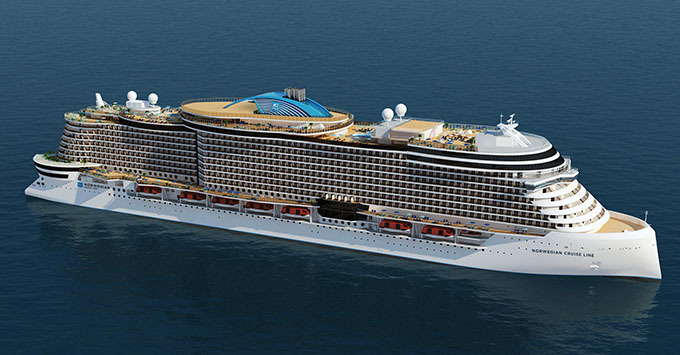 The news pushes the record global cruise ship orderbook to 108 new ships. Norwegian said that at 140,000 gross tons and accommodating approximately 3,300 guests, this next generation class of ships will build upon the highly successful offering of freedom and flexibility found across Norwegian Cruise Line’s fleet, including the most recent Breakaway Plus Class ships, and feature a host of inventive designs that will further elevate its already award-winning guest experience. Trieste, July 12, 2018 – The US group Norwegian Cruise Line Holdings Ltd. has confirmed to Fincantieri the orders for the construction of the fifth and the sixth unit of the “Leonardo” series, a class of new-concept cruise ships for the Norwegian Cruise Line (NCL) brand with deliveries scheduled in 2026 and 2027. The option was included in the agreement signed in February 2017 for the construction of the first 4 units. 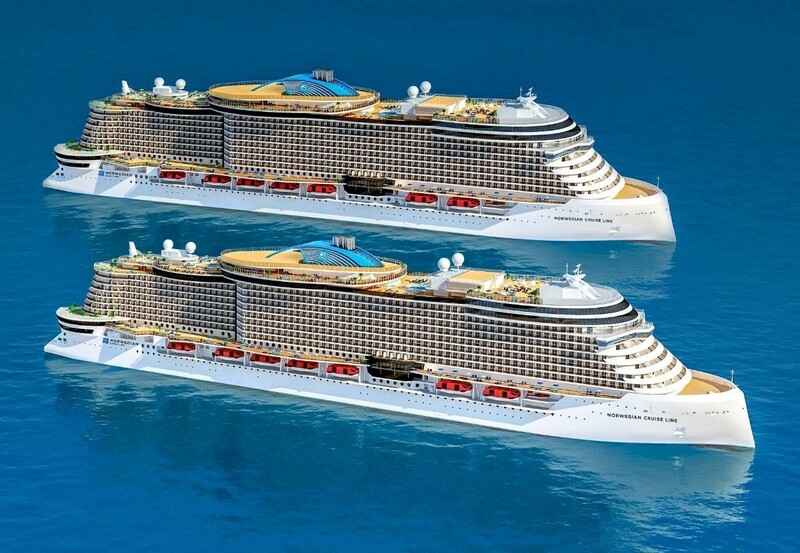 These ships will form the backbone of the future NCL fleet, being about 140,000-tons, almost 300 meters long, and accommodating 3,300 guests. 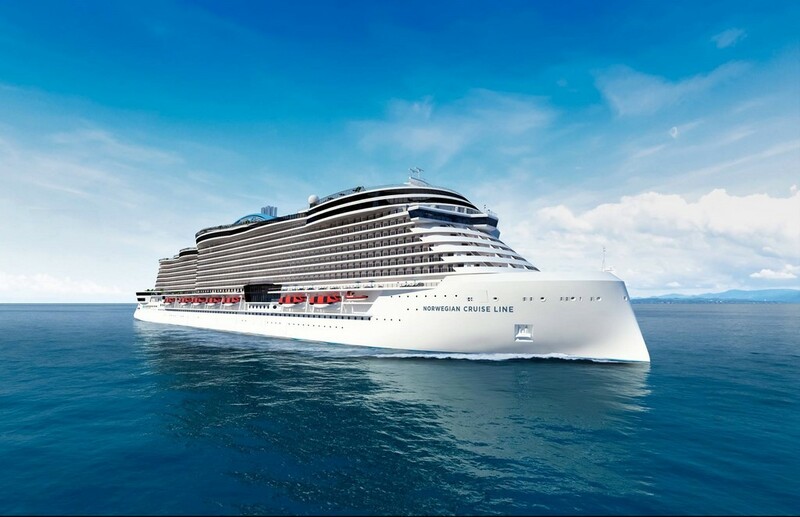 The class is based on a prototype project developed by Fincantieri, which enhances the consolidated features of NCL’s signature offering of freedom and flexibility, qualified by an innovative configuration for an enhanced passenger experience. In addition, focus was set on energy efficiency, with the twofold aim of optimizing consumption at sea and reducing environmental impact, compliant with all the most recent regulations on this matter. Norwegian Cruise Line Holdings is one of the top cruise companies in the world. Besides NCL, it operates the Regent Seven Seas Cruises brand, to which Fincantieri has delivered in Sestri Ponente (Genoa) the ultra-luxury ship “Seven Seas Explorer” in 2016 and is now building a sister ship with delivery expected in 2020 in Ancona, as well as Oceania Cruises, for which the group has built in the yard of Sestri “Marina” and “Riviera”, respectively in 2011 and 2012.